Even subtle abnormalities of the biomechanics of your feet can be the cause of problems affecting your feet, knees, hips and back. 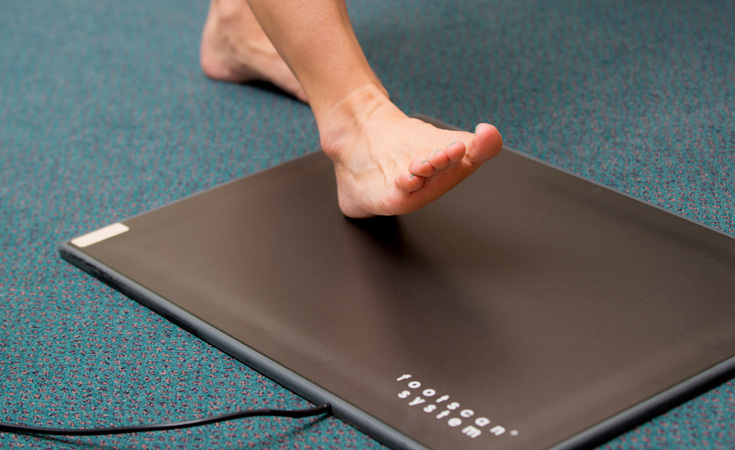 Footscan is a dynamic, computer-generated assessment of the way you walk or run and is undertaken by our physiotherapist John Brodrick at the Rohais surgery. On the basis of the results, bespoke orthotics or insoles can be made to help correct any abnormalities. The Gaitscan system records the timing sequences as you walk across a pressure plate. The results are combined with a lower limb biomechanical analysis, which together can help to determine whether you would benefit from custom moulded foot orthotics in addition to a targeted physiotherapy treatment programme. Any patient who is concerned with how they run or walk can benefit from a gait scan: as well as anyone with localised foot pain, bunions, Hammertoes, heel, leg, knee, hip or back pain, where there is concern that foot biomechanics may be contributing. The physiotherapist needs to be able to see both your spine and pelvis during the scan so first, you will need to undress to your underwear, or you may like to bring shorts and a sports bra with you for more comfort. You will be weighed and a biomechanical assessment will be conducted. You will also be asked to stand on and walk over a plate, which takes a pressure reading from your feet. A follow-up appointment will then be made to discuss the results and the treatment options – either physiotherapy and/or orthotics.